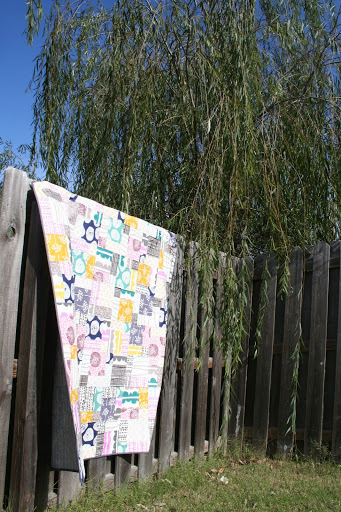 Thanks for stopping by to check out my quilt. 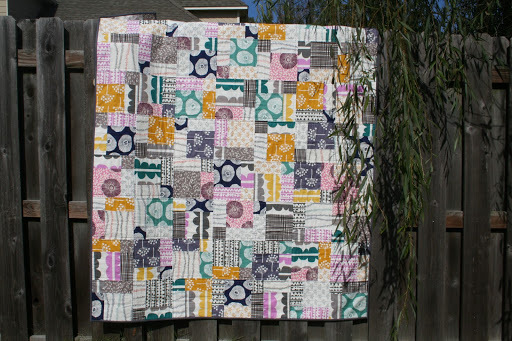 I finished this quilt just in time for the Blogger’s Quilt Festival Fall 2012 hosted by Amy at Amy’s Creative Side. I received a stack of Lotta Jansdotter’s Echo line for Christmas last year from my sister. For a while I just looked at the pretty stack of fabric but then I decided I needed to do something with it! I started this quilt in the spring and had to pause for a few months as we moved from eastern Virginia to western Tennessee. The pattern is a disappearing nine patch and this is my first time trying it. 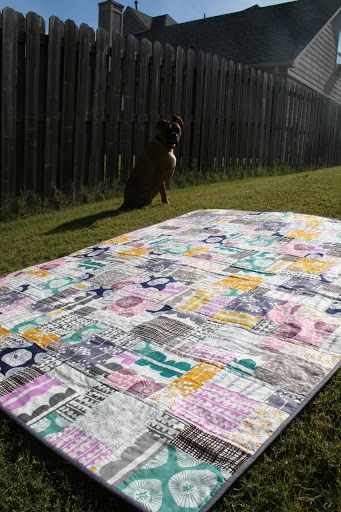 It’s a fairly large throw quilt at 57″ by 72″ and I think it is the biggest quilt I’ve made so far. I’ve been adding it to my side of the bed the last couple nights and it covers me all up and keeps me warm. 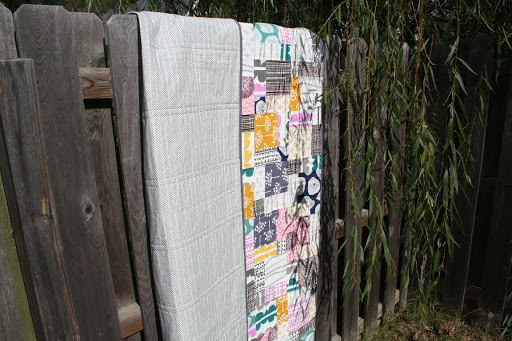 I backed it in a grey and white sheet that I found at Target and the binding is Kona Coal. I’m definitely on the grey bandwagon right now. 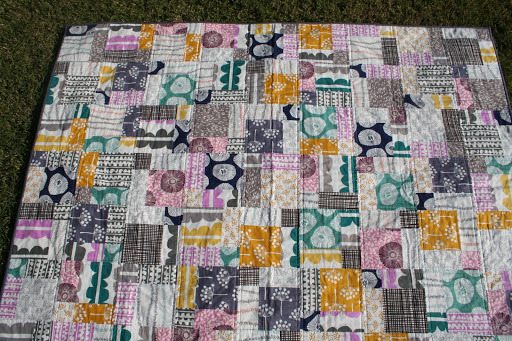 I did straight line quilting on either side of the blocks. This is also my first time taking pictures of a quilt at my new house. There is a beautiful tree that hangs into our backyard and it looked like the perfect corner to take pictures on a beautiful fall day. 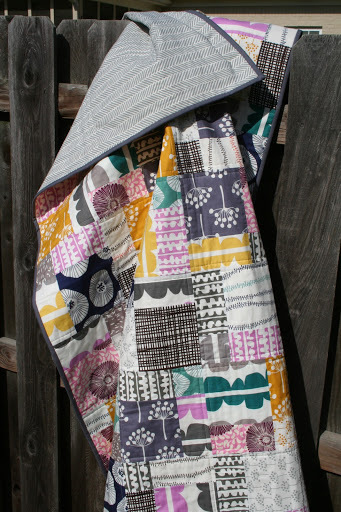 I’m proud of this quilt because I think it is my most precise quilt. I tried to be so careful about everything! 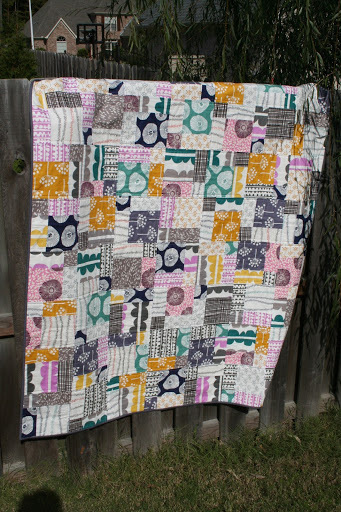 I’m also excited because this is the first quilt I have finished that is for me! I’ve given all the others away and I’m looking forward to hanging out with this one a lot. The dog kept an eye on things while I snapped pictures!